August 9, 2013 Morsy was not only Egypt’s democratically elected president, he is now emerging as the Arab world’s Nelson Mandela. The South African leader brought peace and democracy to his country; during Morsy’s one-year reign, Egypt enjoyed freedom of expression and the right to demonstrate peacefully, and not a single one of his political opponents were jailed. Even when he was ousted by force, he killed no one, jailed no one, and never resorted to violent resistance. This is unparalleled in the region. By maintaining this peaceful approach, Morsy and his followers will have a role not less than that of Mandela’s African National Congress. Despite being subjected to killing, arrest, and oppression, Morsy’s supporters have held fast to the democratic process and prevented Egypt from descending into civil war. The free world must recognize their positive role by supporting them and rejecting the crimes committed against Morsy, his party, and pro-democracy figures. 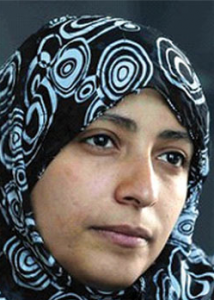 In his August 5 column in the Egyptian daily Al-Yawm Al-Sabi’, Sa’id Al-Shakhat attacked Yemeni human rights activist and Nobel Prize laureate Tawakkul Karman for supporting the demands of the Egyptian Muslim Brotherhood (MB) and opposing the removal of president Muhammad Mursi. Al-Shakhat argues that Karman herself belongs to the MB party in Yemen, although she denies this. He claims that Karman, who was awarded the Nobel Prize for her role as a leader of Yemen’s revolution against the regime of ‘Ali ‘Abdallah Saleh and for her call for respecting the ‘people’s will,’ is committing a crime by abandoning this slogan and favoring the MB’s will over the will of the Egyptian people. Tawakkul Karman did condemn the Egyptian army’s ouster of Muhammad Mursi. Writing on her Facebook and Twitter pages, she called this a military coup and expressed her support for the MB. On July 27, 2013 she claimed on Twitter that she was on her way to Raba’a Al-‘Adawiyya square, where MB supporters were protesting in demand of Mursi’s reinstatement. However, on August 4, the media reported that the Egyptian authorities had apprehended her at Cairo Airport and had prevented her from entering Egypt. In October 2011, we was the first media source to report on Nobel Peace Prize winner Tawakkul Karman’s ties to the Al-Islah Party of Yemen, the Yemeni branch of the Global Muslim Brotherhood. For an extensive profile on Ms. Karman, go here.